Our own label beautifully tailored dress is the perfect piece for your new season wardrobe. 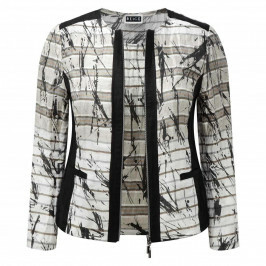 Cut to the knee for a flattering fit, it features an abstract print and square neckline. We love this paired with black heels for a smart summer look. Crushed linen, classic sleeveless dress featuring abstract bamboo print on stripes with black side panels. 85% Linen, 15% Polyamide. Hand Wash or Dry Clean.